Case study with a Mexico-based software development company 2Realpeople that used the Balanced Scorecard framework automated with BSC Designer to model their commercial strategy for the next year. Top managers of the companies recognized BSC Designer as a tool that helps by applying the Balanced Scorecard methodology of Norton and Kaplan in a very user-friendly manner. Jorge Luis Reyes G, CEO, 2Realpeople Solutions SA de CV, Mexico City, Mexico. 2Realpeople Solutions is a software development company. 2Realpeople Solutions’ brand, which is called “Ever-track,” primarily concentrates on providing business solutions that address the areas of asset management, in-house asset tracking solution, GPS asset tracking, custom solutions and logistic services. 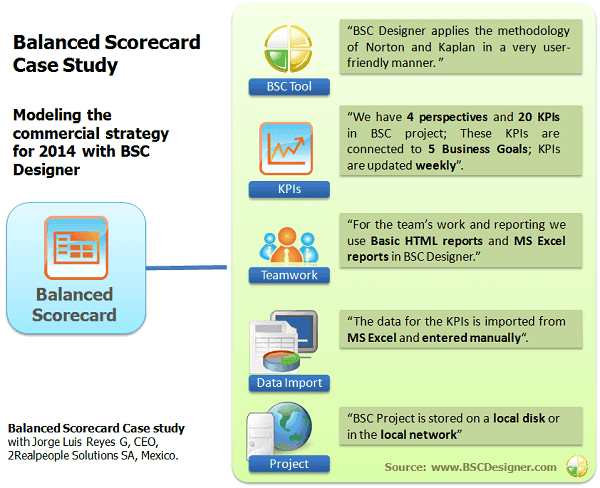 Why did you decide to use BSC Designer for Balanced Scorecard automation? What parameters were important? “I was searching for a BSC tool to help me manage the Balanced Scorecard methodology of Kaplan and Norton in an easy manner at a fair cost. I expected to find a software application that could help to establish my strategy, as well as to follow it, record it, measure and compare it along the time and then solve the common problem of spreading it around in the organization. It happens very frequently that the managerial board has a very clear understanding of the goals and metrics, but the other levels do not. I have not found any open source BSC software that work according to my requirements. I was looking for a software that can integrate with our ERP system, which is another managerial software used in our business. I’ve considered goal tracking tools as well, but I needed something centered more on strategic planning rather than simple tracking. Finally, I stopped on the BSC Designer. The BSC Designer price is very fair. The main advantage that I found is that BSC Designer applies the methodology of Norton and Kaplan in a very user-friendly manner. There are not many software products for the Balanced Scorecard in the market, and BSC Designer developers included the best practices into their software. What was already done and what are your plans about the Balanced Scorecard? Who used Balanced Scorecard in your company and how? “2 persons (CEO, CMO) are involved in the BSC Project “Marketing Strategy.” We used a methodology of tracking called Scrum. Each day we have a 10 minute long meeting, in which we check the plan, the differences, and discuss something that could cause us to not achieve the KPIs’ target values. The BSC Designer software is used as a main dashboard to focus on everyday activities of providing value to the organization. COO provides warranty lead time and installation time details. The information comes from Excel files and from MSSQL databases. We also use Balanced Scorecard to assign tasks to managers. What about line level employees? The line employees report their own metrics. The administrator of BSC uses Excel macros to transform these metrics into KPIs. The IT department can extract the information as well, then process it and then pass it to the BSC Administrator. The line level employees interact with BSC via reports and in the SCRUM meetings, where BSC administrators show the software with KPIs, trends, etc. One of the typical problems that we are facing is to be able spread the strategic information to the middle managers in order to connect the day to day activities to KPIs and business goals. What functions in BSC Designer do you use? “Our Balanced Scorecard project is stored on a local disk or in the local network. In the Balanced Scorecard project we have 4 standard perspectives where we measure 20 KPIs. These KPIs are updated weekly. All of these KPIs are connected to 5 Business Goals. It is very easy to link indicators with business goals and initiatives. I like that the initiatives in BSC Designer have a very broad functionality: we can upload files, add relevant URLs, write comments, add duration information, etc. The data for the KPIs is imported from MS Excel and entered manually. In the future we plan to use SQL indicators more. What Balanced Scorecard training have you passed? What other business methods do you use? Thank you very much for participation in the case study. I’m sure that the BSC Designer will help you map your key objectives, manage KPIs and translate important information to line-level employees.